1. 종로구청장의 대책없는 불법허가로 세입자가 철거민이 되어 투쟁하고 있습니다. 2. 600년 역사의 전통 종로 피맛골 팔아먹은 종로구청장을 규탄하기 위하고 생존권을 찾기 위하여 투쟁하고 있습니다. 3. 세입자를 대책없이 몰아낸 종로구청과 시공사 규탄하고 삶의 터전을 찾기위하여 노숙 투쟁하고 있습니다. 4. 우리는 상인입니다. 우리가 지켜온 피맛골 그것에서 생존권을 복원하기 위하여 노숙 투쟁하고 있습니다. 5. 청진6지구 세입자 철거민은 생존권을 되찾기 위하여노숙 투쟁 하고 있습니다. 1. Tenants have lost their rights and are now fighting against the Chief of Jongno-gu (District) Office who has illegally allowed the removal of their homes without offering any alternative. 2. We are fighting to restore our right to exist and denounce the Jongno-gu Government Office Chief for destroying 600 years of traditional Korean history. 3. 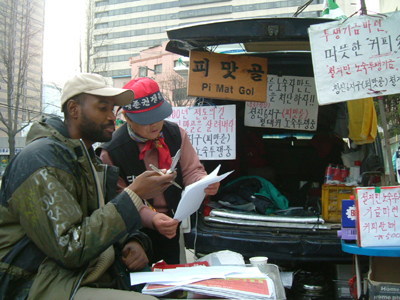 We are encamped in protest against having been evicted, without any redress, by the Jongno-gu Government Office. We denounce the construction company. We are fighting for a place to live. 4. We are shopkeepers and restaurant carriers. We are encamped in protest to struggle to restore our right to stay in and protect the traditional Pi Mat Gol area from destruction. 5. Cheongjin area no 6, a part of Jongno-gu, tenants are encamped in a struggle to restore our right to exist. Since several years we knew about plans to "develop" the area between Jong-no and Jongno-gu Office. Here the Le Meilleur Construction Co. wants to build a huge sky scraper, just for expensive shops, restaurants, exclusive apartments for to sell, private clinics and for financial business. But this plan will destroy the basis of existence of hundreds of families here, who are/were living and working here partly since generations. Because of the fact that, if the plan will be reality, we'll lose everything, from the beginning we were opposing that plans. Last year in a mysterious "accident" several buildings, located directly on Jong-no (avenue), were nearly complete destroyed (eyewitnesses said it was looking like someone was throwing a hand grenade in the shop, or a car was just crashing inside). Just some days later the remaining houses were tearing down and instead a so called huge model house (a model part for the-to build sky scraper) was erected. Later piece for piece the tenants of the houses/shops witch were located behind the buildings (witch were destroyed in the beginning) were driven out, sometimes by using violence. For that the construction company is hiring hundreds of criminal gangs to drive the people out off their homes/work places. Often the gangs are backed by large units of the infamous riot cops to manage their "job". On November 5 the migrant workers web site (...) reported: "Yesterday 10:35 in the morning about 100 criminal gangsters, hired by the not less criminal Le Meilleur Construction (LMC) Co., district government officers backed by riot cops raided Cheongjin-dong area in Jongno-gu (district). The people who carried on the restaurant (when you come from Kyobo B/D on the left side on Jong-no, opposite of LG 25 “super” market) were forced to leave. With this criminal act LMC destroyed the basis of existence for some families. But not just that, they robed the activists who defend their homes their office, because it was located in the second floor of the building." Now since 29 days we are in a daily 24 hours sit-in strike in front of Jongno-gu Office to protest against the using of terror against us. We are no criminals - we just are defending our basis of existence! And we are not only fighting ourselves – we are fighting also for our neighbors and at least for the future of the center of our city. Since hundreds of years Jong-no was the main avenue in the Korean capital. But all the “ordinary” people who were walking there, every time when some one from the nearby king palace (Gyeongbok-gung) were passing the street, all the “ordinary” people had to bow on the street until the person went. So 600 years ago the people started to build the narrow lanes behind the first line of buildings located on Jong-no to avoid bowing once per hour. So in fact Pi Mat Gol is a result of a kind of resistance against the rulers. Nowadays motto of Jongno-gu Office: “Human, natural…” – it’s just a bad joke. Especially when you see the English web site, where they just make advertisement with the great history, what they already planned to destroy.